The migration of the dinosaurs across the globe was so rapid that it may have contributed to their demise, new research has found. A study by University of Reading scientists for the first time reveals the paths taken by the dinosaurs as they expanded out of South America during their rise to world dominance. The research shows that the speed of this expansion meant that the dinosaurs quickly became cosmopolitan and subsequently ran out of land. This lack of space then seriously impeded their ability to produce new species. 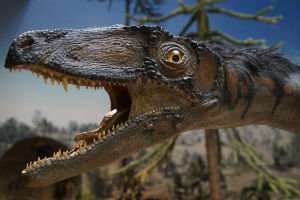 The work, published in Nature Ecology and Evolution, links to a previous Reading study that revealed the dinosaurs were in decline as a species 50 million years before the asteroid strike that finally wiped them out. Ciara O'Donovan, evolutionary biologist at the University of Reading and lead author of the study, said: "Fossil evidence has shown us where the dinosaurs started out and where they died, but there is an important middle period that little was known about. Our research fills this gap in prehistory by revealing how the dinosaurs spread, how fast they moved and what directions they moved in through time. "The dinosaurs exploded out of South America in a frenzy of movement to cover the planet. It was during this time that diverse forms evolved and eventually led to species such as the fearsome Tyrannosaurus rex, Archaeopteryx (the earliest bird) and the gigantic, long necked Diplodocus. This honeymoon period could not last forever though, and the dinosaurs eventually filled every available habitat on Earth. "There was nowhere new for species to move to, which may have prevented new species from arising, contributing to the dinosaurs' pre-asteroid decline. In essence, they were perhaps too successful for their own good." Fossil evidence shows dinosaurs originated in the late Triassic Period (around 230 million years ago) in South America, which was then part of the huge land mass called Pangea. This closely followed the world's largest extinction event that wiped out almost all of life on Earth. The scientists developed a novel, statistical method to uncover where every dinosaur species' ancestors existed, in three dimensional space, on the globe. By doing this they were able to demonstrate that the dinosaurs spread unchecked across the huge available space, at a rate of 1,000km/million years. They dominated every terrestrial habitat, across all the continents as they drifted apart, over the course of 170 million years. This saturation of the Earth caused the dinosaurs to become increasingly specialised to live in their existing environment, resulting in a fundamental change in the way they evolved and produced new species. This curbed their progress and left them vulnerable to future changes in the environment, such as those caused by the asteroid strike. Dr. Chris Venditti, evolutionary biologist at the University of Reading and co-author of the paper, said: "Early dinosaurs had a blank canvas and spread quickly across the devastated Earth, taking up every opportunity in their path. Virtually every door was open to them as there was no competition from other species. "The inability of the dinosaurs to adapt rapidly enough as the Earth became full may explain why they were in decline prior to the asteroid strike, and why they were so susceptible to almost total extinction when it hit." "study that revealed the dinosaurs were in decline as a species 50 million years before"
Incorrect use of "species" - should be "class". High flying birds use less oxygen, I heard on the internet (:P). Some have a larger variation of physical conditions in their normal range of habitats than most animals, dont they? Could that environmental adaptability (capability?) have been part of what allowed avians to pass through the KT boundary?